SHANGHAI, Nov. 8 (Xinhua) -- Mozambican businessman Alexandre Santos made the transcontinental trip to China's first import expo, hoping the event will be the prelude to the success of his small firm. He is here to showcase organic Moringa tea to China, a country known for tea-drinking traditions. He is feeling very confident because the wholesome leaves can cater to a booming market of health-conscious consumers. "I believe the Chinese will be interested in our products. Several local dealers have already approached us," he said at a booth surrounded by similar African firms at the ongoing China International Import Expo (CIIE) in Shanghai. Mozambique has joined dozens of developing economies, including the least developed ones, at the world's first import-themed national-level expo. From African tea to Brazilian football coaching, their goods and services are in a pole position to cash in on the increasingly diversified demands of the world's biggest middle-income population. In his keynote speech at the opening ceremony of the CIIE, Chinese President Xi Jinping said that China will continue to unleash the potential of the domestic market and expand the scope of imports. In the next 15 years, China's imported goods and services are estimated to exceed 30 trillion U.S. dollars and 10 trillion U.S. dollars, respectively, Xi said. "It is our sincere commitment to open the Chinese market to all countries," he said. Visitors at the Georgian booth are greeted with aisles lined with shiny short bar counters, where they can chat with vendors over sips of wine from a region with a long history of wine-making. "The expo has brought the world's best wines to a market far from saturated," said Huang Qinghua, general manager of Tianjin Hanzhong International Trade Co., after tasting the exhibit's wine. "The Chinese market keeps upgrading and creating new opportunities for the world," he said. "We have a vibrant market here with thriving demand for high-quality exotic products." Gashora Farm, a Rwandan chili maker, made its debut in China at the CIIE. "I was so late to this market. Our products have already been supplied to India and Europe," said Dieudonne Twahirwa, managing director of the company. Twahirwa said the company hopes to find distributors for the organic product in China at the expo. It has already secured a contract worth two million U.S. dollars with a Chinese buyer. China's state-owned enterprises are placing large orders at the CIIE to meet consumer demand for imported goods. China's largest food trade company COFCO, for example, has so far inked import deals on farm produce with more than 84 suppliers from 29 countries and regions across five continents. "We import rice from Thailand not because we are short of supply. As consumer demand gets diversified, imported goods will give them more choices," said Yu Xubo, COFCO president. For William Ding, founder and CEO of Chinese Internet giant Netease, the CIIE means golden opportunities for importors in the next two to three years. The company is banking on its online shopping subsidiary to help more foreign brands reach Chinese customers. "The Chinese market will remain the world's best market for decades to come," he said during a speech at a CIIE forum. Santos Futebol Clube, where world-renowned footballers Pele and Neymar made their professional debuts, has teamed up with Chinese schools to help cultivate the next generation of great soccer players. "We will bring our expertise in professional football training to schools and enable more Chinese kids to enjoy the game without worrying about their school work," said Fang Ze with the club's Chinese agency. Sport-related services are part of the growing service trade between China and Brazil, its largest source of service imports in Latin America. China imported 5.49 billion U.S. dollars worth of Brazilian services last year alone, up almost 60 percent year on year. Developing economies like Brazil are not only expanding their consumer goods exports to China, but also offering a wider range of competitive services to tap the country's niche markets. 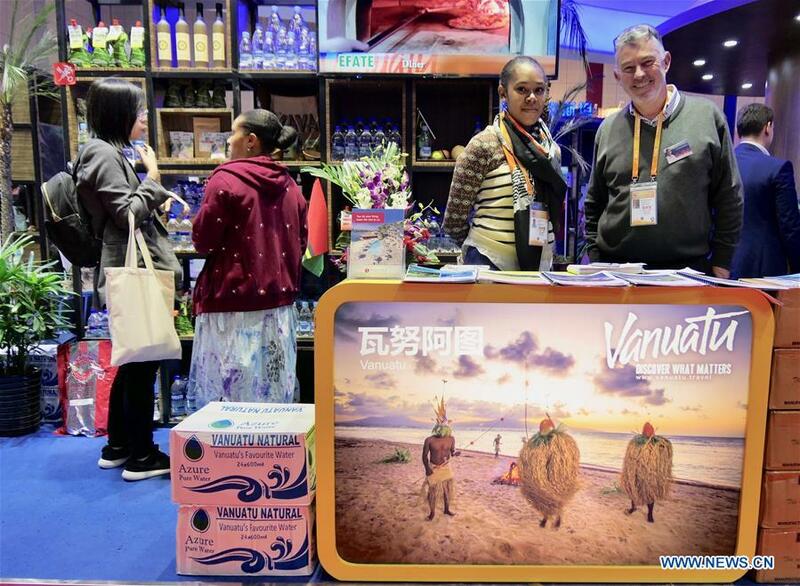 Moses Bani, a tourism official from Vanuatu, said the South Pacific island nation has seen an increasing number of Chinese tourists, referring to the Chinese market as a "bonanza" with huge untapped potential. Air Vanuatu is preparing to launch direct flights to China, Bani said. China's cumulative service imports are expected to exceed 2.5 trillion U.S. dollars in the next five years, a Ministry of Commerce (MOC) report showed Tuesday. "As Chinese people's livelihoods continue to improve, the demand for imported services in fields ranging from traveling to cultural consumption will see rapid growth in the future," said Xian Guoyi, head of MOC's department of trade in services and commercial services.